Leendert (Léon) Pors is a geologist who, instead of working for an oil or ore company, opted for a career in wildlife conservation and environmental education. He has been in this field for over 20 years. 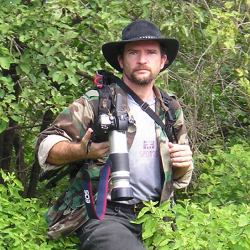 One of his passions is wildlife photography, and through his images he wants to share his love and respect for nature with the world. He was ‘bitten by the nature-bug’ while living in Suriname for 10 years during his teenage years. The Netherlands offered him the opportunity to study, but his issues with the climate and the over-organized character of Dutch society drove him towards Curacao the moment he graduated. Leon is the director of the Curacao Footprint Foundation. Meet him on Facebook and LinkedIn. Or contact him at info@curacaofootprint.org. You can also follow us on twitter.com/caribfootprint.